Cavalry charges might win a battle, but with poor leadership they could end in disaster. The key to success was the impact caused when fast-moving objects hit slow or stationary ones. Control was more important than speed, so attacks at the gallop were rare. Many British cavalry charges are remembered and celebrated because of the risk involved, whether successful or not. Fought during the War of the Spanish Succession (1701-14), Blenheim saw the Duke of Marlborough lead an Allied force against the French. Although outnumbered, he realised that his enemies' position did not allow them to move easily around the battlefield. He pinned down the French flanks and then delivered a crushing blow with his 80 cavalry squadrons against the enemy’s weakly defended centre. His horsemen stormed across the Nebel stream and attacked the disorganised French cavalry, who were routed. Marlborough’s cavalry then wheeled left and joined the infantry in forcing the French into the River Danube, where many drowned. France suffered its first major defeat for 40 years, losing over 30,000 casualties and having its commander-in-chief captured. At the Battle of Emsdorf, during the Seven Years’ War (1756-63), the British and Hanoverian troops surprised their French enemies before they could form up properly. Colonel George Eliott's 15th Light Dragoons then repeatedly charged the French as they tried to retreat. They broke five battalions of enemy infantry in rapid succession before capturing five guns and a howitzer. They also took 1,650 prisoners, including the French commander Marshal Glaubitz and the Prince of Anhalt. The 15th Dragoons later presented King George III with nine colours that they had captured at the battle. 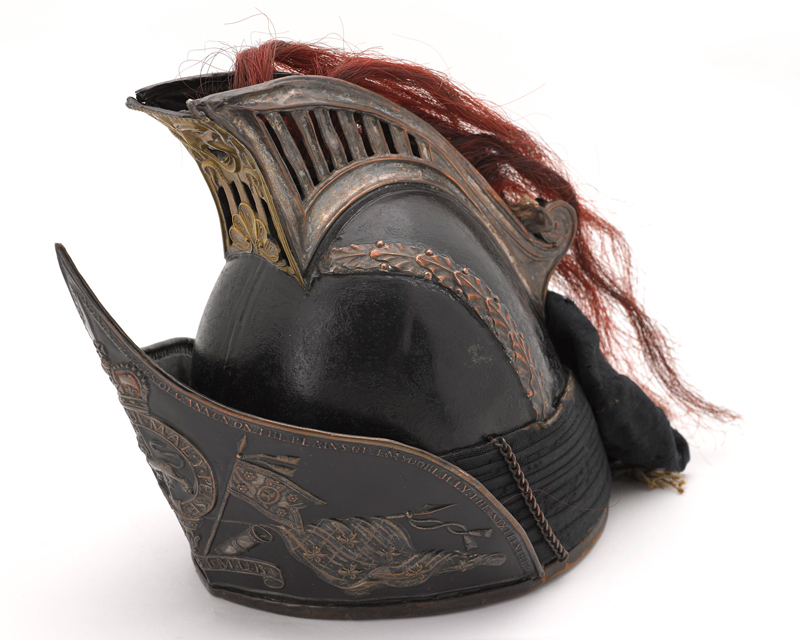 In return, he ordered them to wear the title ‘Emsdorf’ on their light dragoon helmets. This was the first ever battle honour awarded. At Waterloo, the famous battle between the Duke of Wellington and the French Emperor Napoleon, four huge columns of French infantry marched on the outnumbered Anglo-Allied forces. 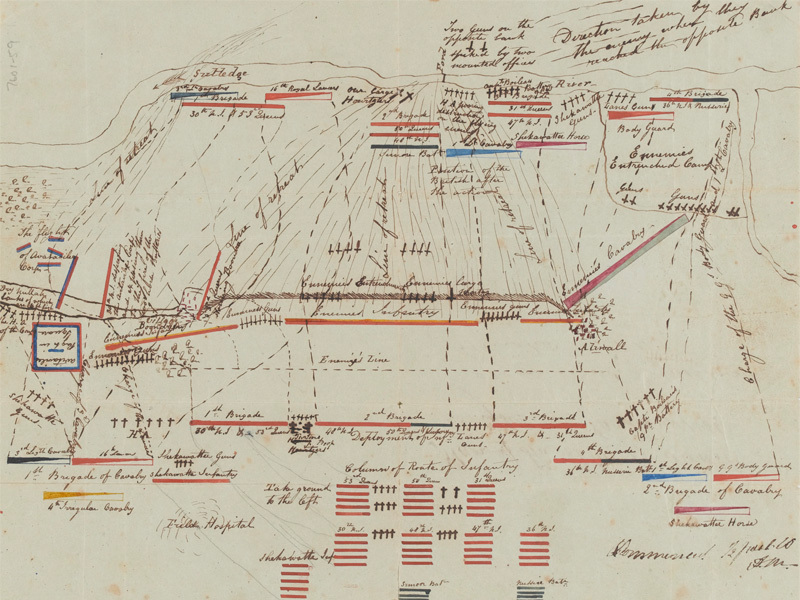 Wellington’s infantry could not hold off Napoleon’s forces for long. But two British cavalry brigades were hidden behind a ridge. When the order came, they surged over the ridge straight towards the enemy. The force of the British charge smashed through the French infantry. But the lack of control meant the British heavy cavalry rode too far and were eventually destroyed when French cavalry counter-attacked. 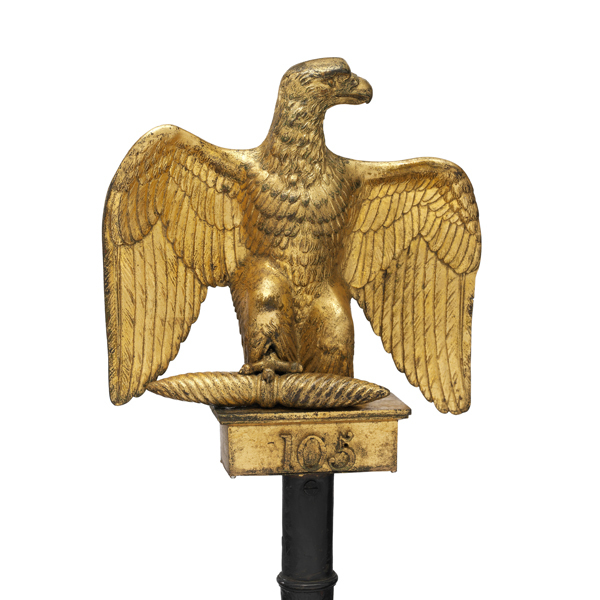 Losses were high on both sides, but the Royal Scots Greys and the 1st Royal Regiment of Dragoons won a symbolic victory by capturing two of Napoleon’s French eagle standards. 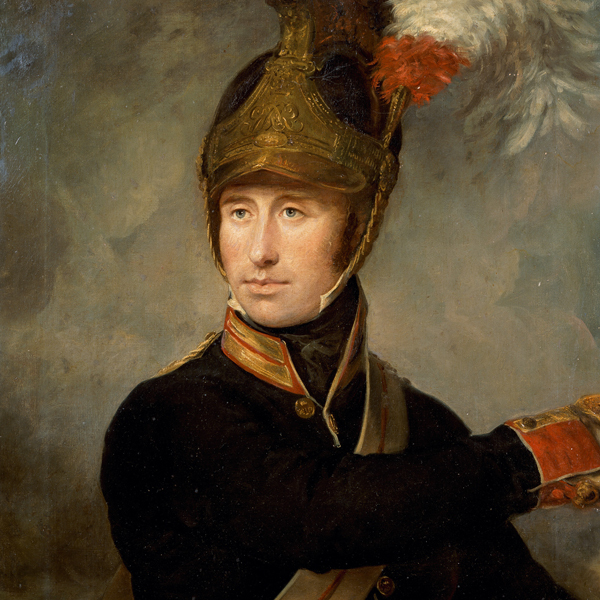 Captain William Tyrwhitt-Drake of the Royal Horse Guards took part in the charge against the French centre at Waterloo. On 16 August 1819, a meeting was held at St Peter’s Field in Manchester. It had been organised by the Manchester Patriotic Union Society, a political group calling for parliamentary reform and the repeal of the Corn Laws. At least 60,000 people attended. Local magistrates were concerned that the meeting would cause a riot and they arranged for 600 troops to be present. All was peaceful until the magistrates attempted to end the meeting. After the Riot Act was read, the cavalry tried to arrest the speakers by cutting their way through the crowd with sabres. Eleven were killed and over 400 people, including women and children, were trampled by cavalry horses. The events were reported in the ‘Manchester Observer’, which coined the phrase ‘Peterloo Massacre’ to describe the event in ironic reference to the recent Battle of Waterloo in 1815. In 1845-46, the British fought a war against the powerful Sikh state of the Punjab. The Sikh cavalry was highly skilled and very effective against the British Army when it was spread out on the march. They had successfully captured most of the British baggage animals before the battle at Aliwal. Sir Harry Smith led the British. He was an experienced soldier who had fought in the Napoleonic Wars. He stayed calm until his army was ready to attack. During the battle, the 16th (The Queen’s) Lancers charged into the Sikh infantry. Major John Smyth led the attack with a cry of ‘Boys, three cheers for the Queen… Lancers Charge’. Smyth was among the many lancers wounded, but several Sikh guns were captured or put out of action. The infantry and horse artillery then drove the Sikhs from the battlefield. The Battle of Balaklava, during the Crimean War (1854-56), witnessed two of the most famous cavalry charges in British Army history. The first major charge of the battle was by the Heavy Brigade. A large Russian cavalry force had been repelled by the ‘Thin Red Line’ of British infantry, but stopped as it came towards the British camp. This mistake laid it open to attack, and the British heavy cavalry charged. With luck and skill, the outnumbered British drove the Russian horsemen from the field. This action, said to have been over in eight minutes, showed how strong cavalry could be, even against superior numbers. The other major charge at Balaklava was the Charge of the Light Brigade - one of the Army's best-known blunders. It came about because of poor communication and the inexperience of the officers involved. The British commander, Lord Raglan, was keen to follow up the Heavy Brigade’s success. Overlooking the battle from high up on a hill, he gave the order for the cavalry to stop the Russians carrying off some British artillery they had captured earlier on. But Lord Lucan, in charge of the cavalry, was positioned down in a valley. The only artillery he could see was a battery of Russian guns. Despite his confusion at Raglan's order, he sent Lord Cardigan to attack them with the Light Brigade. The men and horses bravely charged through heavy fire at the Russian guns. Within 20 minutes, more than 260 men had been killed, wounded, or taken prisoner, and 475 horses were lost. Following the deaths of the British resident and his guard at Kabul in September 1879, the 9th (Queen’s Royal) Lancers joined Major-General Sir Frederick Roberts on the march to the Afghan capital. On 11 December, a squadron of the regiment encountered a huge Afghan force near Killa Kazi. Roberts wanted to delay the enemy’s advance on Kabul, so gave the order for 170 men to charge around 10,000 Afghans. Losses were heavy. The 9th Lancers suffered 18 officers and men killed, and 10 more wounded. 46 horses died. Despite their severe mauling, the 9th Lancers remained in Kabul until August 1880, when it joined Roberts's epic 300-mile (480km) relief march to Kandahar. In August 1882, an Egyptian army led by Ahmed Urabi attacked the British troops at Kassassin in order to recapture the Suez Canal. The outcome of the battle was in the balance until the arrival of British reinforcements who finally broke the Egyptians. Legend has it that the Household Cavalry regiment arrived as it was getting dark, and immediately went into action. By moonlight, they cut their way through the Egyptian infantry to reach a battery of guns behind them. Queen Victoria herself had specially requested the inclusion of the Household Cavalry in General Sir Garnet Wolseley’s expeditionary force. 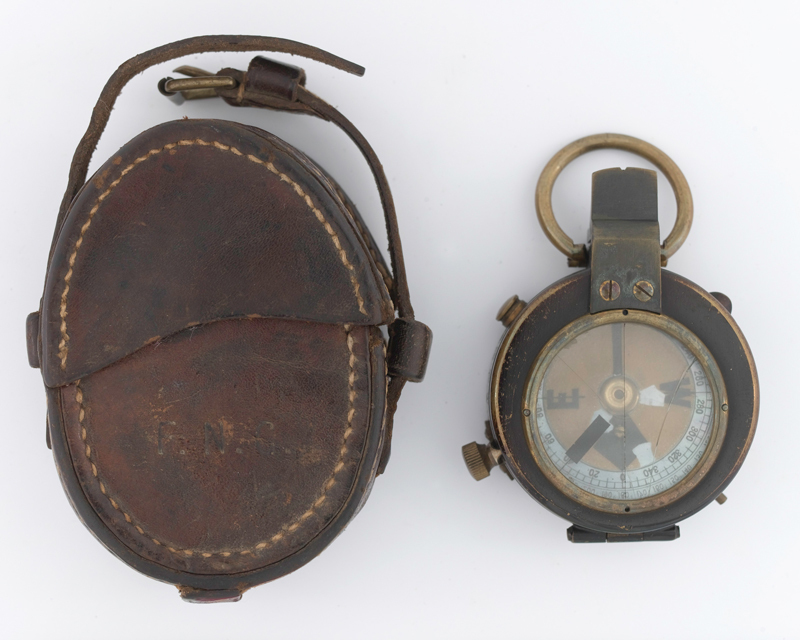 Their ‘midnight’ or ‘moonlight’ charge became one of the most famous incidents of the Egyptian War (1882). The British were hugely outnumbered by the Sudanese Dervish tribesmen at Omdurman. But they had superior firepower and had mown down their enemy in the first phase of the battle. General Herbert Kitchener, who was commanding the British-Egyptian army, was anxious to capture Khartoum before the remaining Dervish force could retreat there. He ordered the 21st Lancers to clear the route ahead. The lancers were so eager to attack that the trumpeter barely had time to sound the ‘trot’ before they charged. The lancers could only see a small part of the enemy force and could not stop before rushing into a gully full of 2,500 hidden tribesmen. The Dervishes stood their ground, killing 21 lancers and wounding many more. Half the 447 horses on the charge were also killed or hurt. But the lancers regrouped and proceeded on foot, using their carbines to drive off the enemy. Some officers thought the infamous action of the 21st Lancers at Omdurman was reckless. Others saw it as proof that cavalry were still more than just mounted infantry. During their invasion of Natal, the Boers captured the railway station at Elandslaagte, cutting communications with Ladysmith and Dundee. The British responded by driving them out of this position with the skilful deployment of dismounted cavalry units and infantry. As the Boers mounted their horses and started to retreat, two British cavalry squadrons charged them three times as darkness was setting in. Many Boers were cut down and two field guns were captured. The attack was one of the few successful cavalry charges of the Boer War (1899-1902). Captain Francis Grenfell led a charge of the 9th (Queen’s Royal) Lancers at Audregnies in Belgium during the First World War (1914-18). Grenfell was an accomplished horseman and a fine polo player, but the charge he led was a disaster. The lancers faced an unbroken German line of rifle, machine-gun and artillery fire before being halted by barbed wire. Casualties were high and Grenfell himself was severely wounded. But as the commander, he remained a rallying point for his troops in spite of his injuries. Later, Grenfell and his men also helped save British guns from capture. Grenfell was awarded the Victoria Cross (VC) for this action. His citation was the first officially listed in ‘The London Gazette’. Because of this, some recognise his VC as the first of the war, even though it was not the first to be awarded. Grenfell was killed in action a year later on 24 May 1915 after being wounded twice at Hooge. 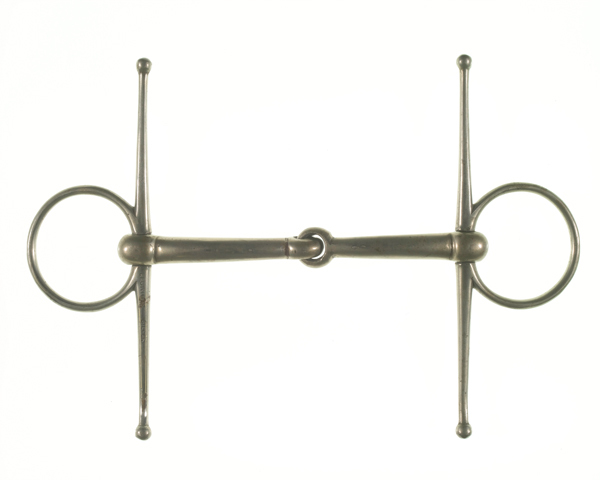 Even in the 17th and 18th centuries, the success of fighting on horseback was limited by weapons like stakes, pikes and cannon, and tactics like forming infantry into squares or volley fire. But it was the awful casualties caused by modern artillery, rifles and machine-guns that ultimately rendered cavalry charges ineffective. Nevertheless, the King's Troop, Royal Horse Artillery, still practises charging as part of their annual training sessions on the beaches of Cornwall. The exercise is distinctly different from a battle charge, but it helps to build trust and confidence between horse and rider, and prepares the animals for unpredictable events that may occur while on ceremonial duties in London. Horses have played a vital role in supporting soldiers on and off the battlefield. Explore the stories of some of the most incredible horses in British military history. 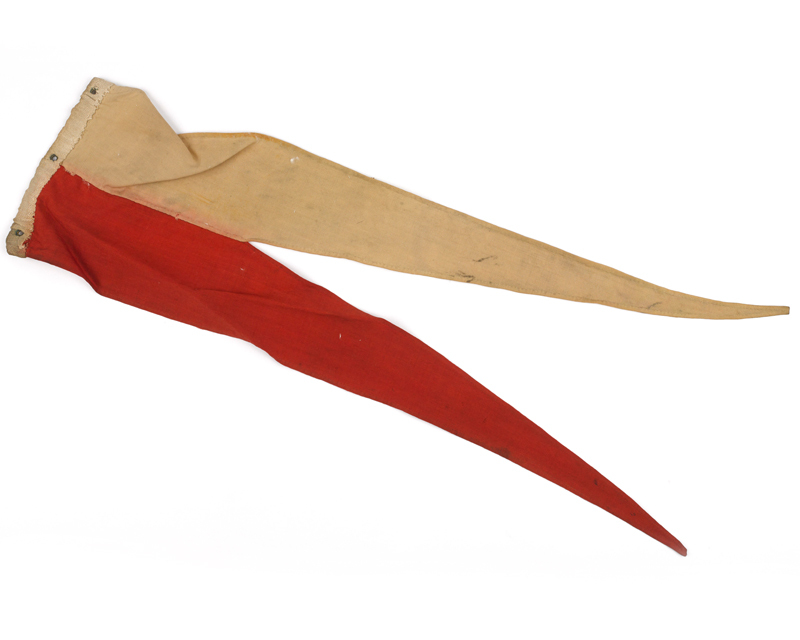 Jimson was the beloved mascot of 2nd Battalion, The Middlesex Regiment. 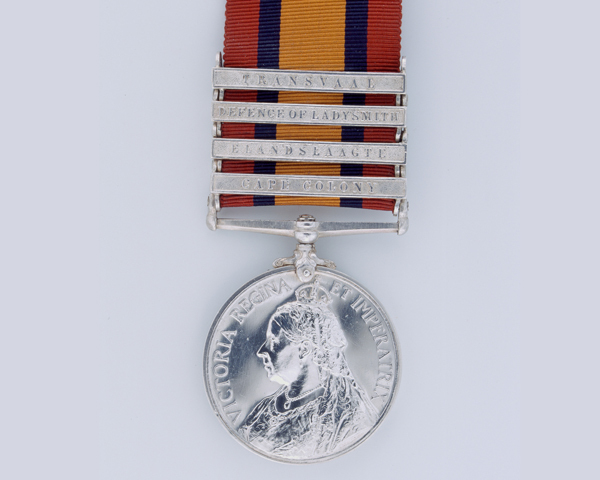 He was 'awarded' medals for service in India and the Boer War.